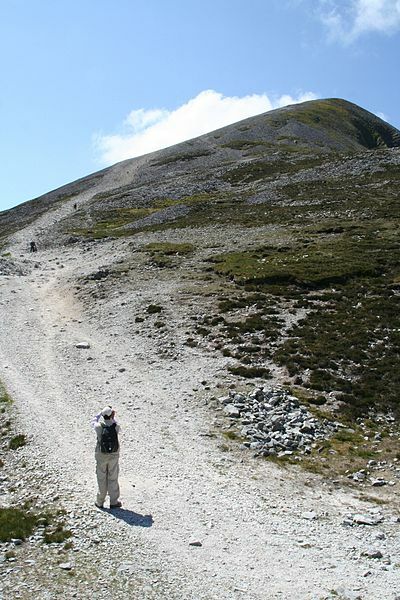 Today,on the last Sunday of July thousands are on the slopes of Croagh Patrick, braving heat, thundery downpours and winds, to make a personal pilgrimage to the top of this iconic mountain. Here is a post I made on this day in 2011 about the mountain. Long before St Patrick’s arrival however, the mountain had been a sacred place. In the Celtic tradition, the Festival of Lughnasa (pronounced Loo -nasa) was celebrated on August 1st ( Lughnasa is also the Irish word for August). This was an annual festival honouring the god Lugh (pronounced Loo) at harvest time. 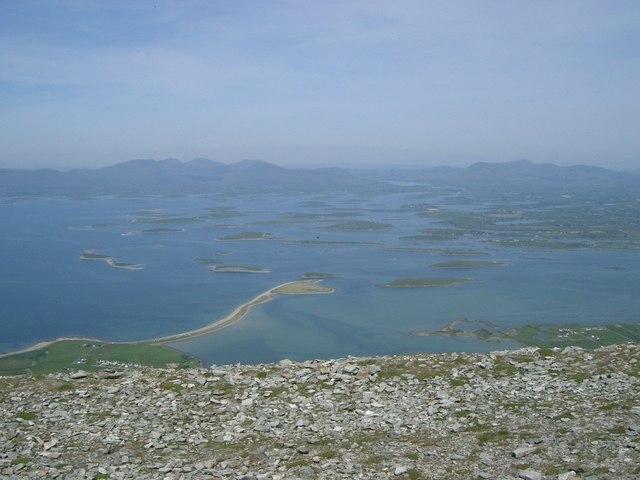 Across the country festivities took place, often on mountains such as Croagh Patrick. Lughnasa was the most important Fire Festival of the Celts and in common with many other pagan festivals and traditions it was Christianized and adopted by the church in a different guise. Croagh Patrick and the surrounding landscape has much archaeological evidence of the sacredness of this place, going back millenia. A rock, known locally as St Patrick’s Chair, has engravings that date as far back as the neolithic, thousands of years before Christ. Also in the area, remains of a hillfort have been discovered that dates from before 800 B.C.The local archaeological society recently discovered that, each year on April 18th and August 24th, the sun sets on the summit of Croagh Patrick, and then – rather than slipping behind the mountain – it seems to ‘roll’ down the steep slope. To see a terrific sequence of ‘rolling sun’ images, click here. Croagh Patrick is a spectacular and special place whose appeal to ordinary humans has lasted thousands of years, and without doubt, will continue to do so for thousands of years to come. 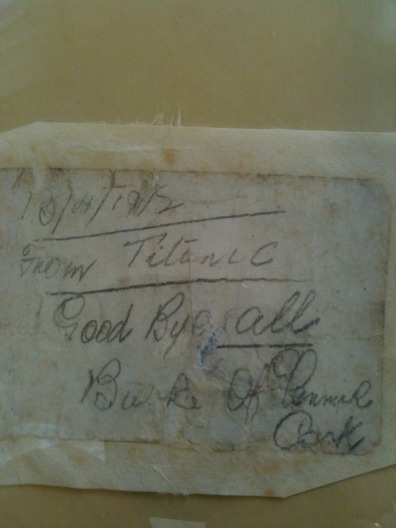 April 14 1912: Iceberg Ahead! Good Bye all! As RMS Titanic steamed towards New York, several iceberg warnings had been issued during the day of April 14 ,1912. At 11.40 pm, with many passengers already in bed for the night, the lookout shouted ‘Iceberg Ahead’! Despite frantic attempts to manoeuvre the huge vessel, she hit the iceberg, ripping plates from her hull and leaving a huge gash in her side. Within minutes there were 14 feet of water in parts of the ship and the flooding continued relentlessly into each ‘watertight’ compartment. 25 minutes later, on April 15 1912 at 5 minutes past midnight an order is given to prepare the lifeboats. If all are filled to capacity over 1,000 people would have to stay on board as there are not enough of them. At 00.45 am the first lifeboat is lowered, with only 28 people on board – it had space for 65. At 2. 05 am there are 1,500 still on board the liner but there is only one lifeboat left to be launched. The water is now just below the promenade deck. The huge ship is now listing and people on board rush about in panic, trying to escape the freezing waters. At 2.17 Titanic’s bow plunges underwater and as all the heavy machinery slips forward, the lights flicker and go out. The ship breaks in two and the bow disappears into the icy water. Three minutes later, at 2.20 am the stern section which had risen up into the air, plunges into the icy depths. At 2.20 am in the village of Lahardane in County Mayo in the west of Ireland a bell will peal 11 mournful peals, followed by 3 joyful peals in memory of the 14 people from this small community who were passengers on the Titanic. 11 of them were lost and 3 survived. It is probably the only location in the world where the last moment of the great Titanic is remembered ever year at the exact time of the sinking. Of the approximate 2,227 on board, about 713 survived. Lahardane’s commemorative bells peal across the land to remember all of those lost and saved. 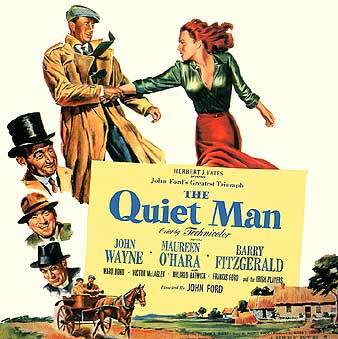 Promotional movie poster for The Quiet Man. (This image is used to illustrate the article on 'The Quiet Man' movie and is used for informational or educational purposes only). ‘A fine soft day in the spring, it was, when the train pulled into Castletown, three hours late, as usual, and himself got off. He didn’t have the look of an American tourist at all about him.’ This is the opening narration in the movie ‘The Quiet Man’, much of which was filmed on location near the beautiful village of Cong, Co Mayo, Ireland. John Ford’s 1952 film was a resounding success, and 60 years on its popularity continues, for it is said that every minute of every day,someone in the world is watching ‘The Quiet Man’. The Bridge seen in the film 'The Quiet Man'. 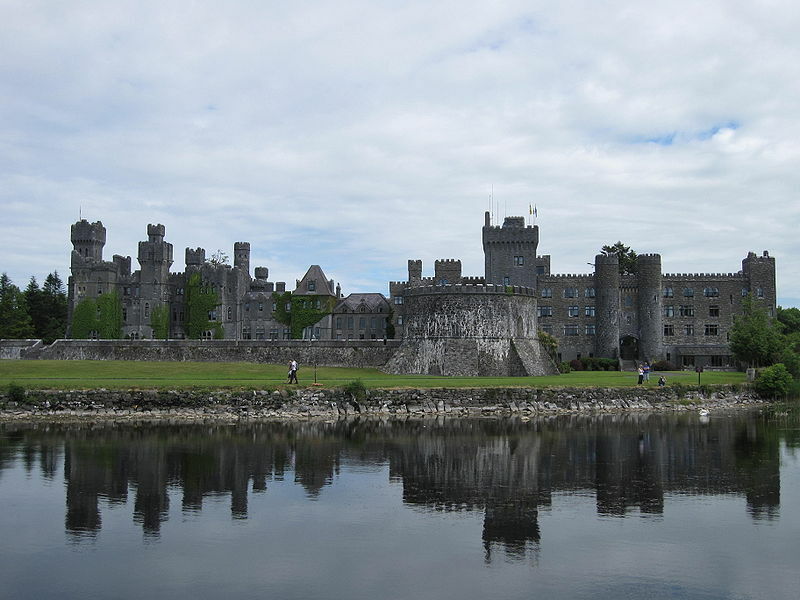 Photographed by Susan Astray, creative.commons. The film’s representation of Ireland appealed to the diaspora and to those who longed to be home. 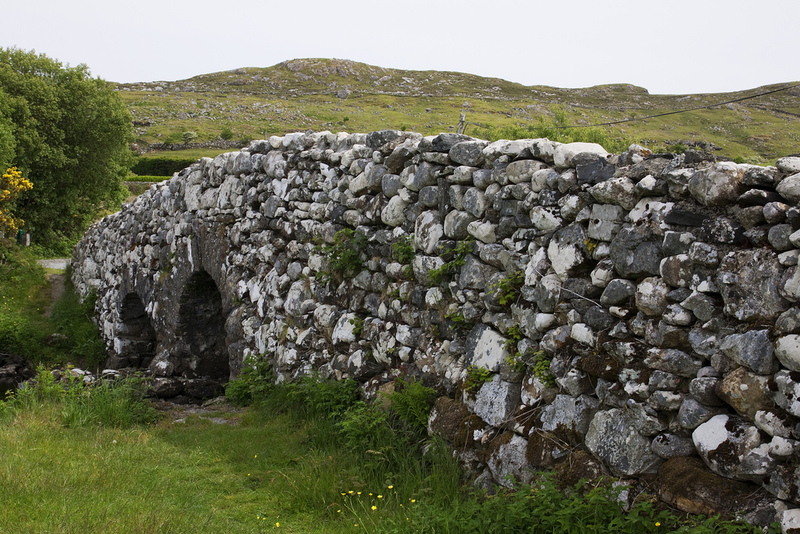 The West of Ireland had indeed come to symbolize all of Ireland and had become the image of the country left behind, helped by the interest of writers in the latter years of the 19th century,such as J.M.Synge and W.B. Yeats. The dramatic landscape of the west was a backdrop in modern Irish literature and its remoteness probably led to it being seen as the part of Ireland least affected by British rule and therefore a more ‘authentic’ Ireland. While the image of Ireland portrayed in the film became for many the epitome of romantic Ireland, for others it represented the worst of ‘stage Irishness’ with its Hollywood ‘Oirish’ accents. Maureen O’Hara played the role of the feisty fiery red-head, Mary Kate Danaher. Now in her 92nd year,Maureen O’Hara returned to Cong, Co.Mayo in recent weeks to mark the 60th anniversary of the beginning of filming. ‘The Quiet Man’ continues to attract huge numbers of visitors to this very special part of Ireland. ‘The Quiet Man’ Cottage Museum in Cong has an exact replica of the interior of the famous ‘White O’ Morn’ cottage and there are many sites of interest to fans,not least of which is the beautiful Ashford Castle, and the many wild and beautiful scenic attractions of Connemara.